Juice Plus Just Arrived At Our Door- We Are Excited! 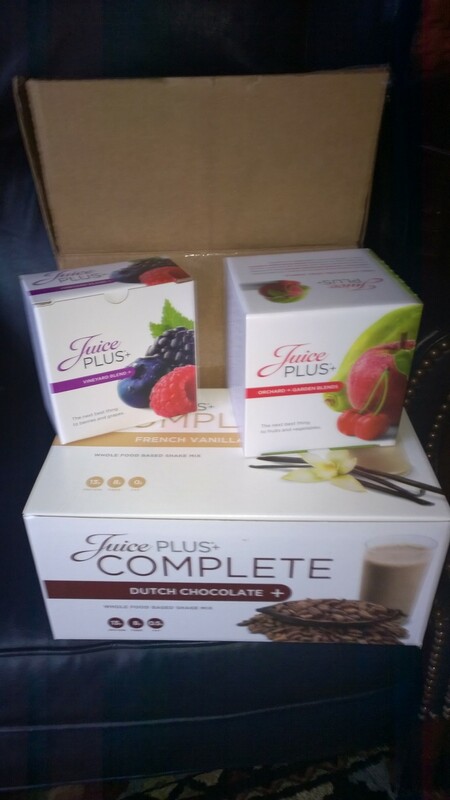 We are so excited as we just received our first Juice Plus Whole Food’s Vineyard and Orchard and Garden Blend Supplements and the Dutch Chocolate Whole Foods Shakes! You may ask “Why are we so excited?” We are excited because not only have we decided to reenergize ourselves through exercise (now that we are both 50-Welcome to the club David!) we have decided to also change the way we take care of ourselves from a nutritional perspective. One thing we know for sure is that we don’t eat properly to fuel and protect our bodies given the amount of running we are engaged in as well as the stress imposed on our body as we age. The micro nutrition that one receives from fruits and vegetables has been found to help reduce chronic disease, aging and impaired athletic performance that can be a result from oxidative stress! There are so many studies out there that talk about the benefits of fruits and vegetables in your diet (up to 8 servings a day) that it just made sense to choose a whole foods supplement that would help us meet our 8 serving requirement! We tried the shakes a couple of months ago and enjoyed the taste but most importantly like the fact that they are made out of whole foods as well! At the end of the day, as you can see from our blog, we enjoy life together. We want to insure that we have many more healthy years together and we are excited about the benefits that we may enjoy together by incorporating Juice Plus into our lifestyle! This entry was posted in KETO RECIPES and tagged Juice Plus by TwogetherRunners. Bookmark the permalink.